Chicago’s skyline has many facets. Viewed from varied distances and vantage points, the city center can look imposing, majestic, or at times surreal. On postcards, views from the lakefront dominate. But I have always loved the view from the near South Side, at a point in the city’s topography where the low bungalows of Bridgeport and Chinatown give way to the utter flatness of river and railyards before exploding skywards north of Harrison Street. The building pictured in the foreground is the only thing that breaks the aforementioned flatness around Roosevelt Road; it is the power plant for the nearby train station and (now defunct) post office. 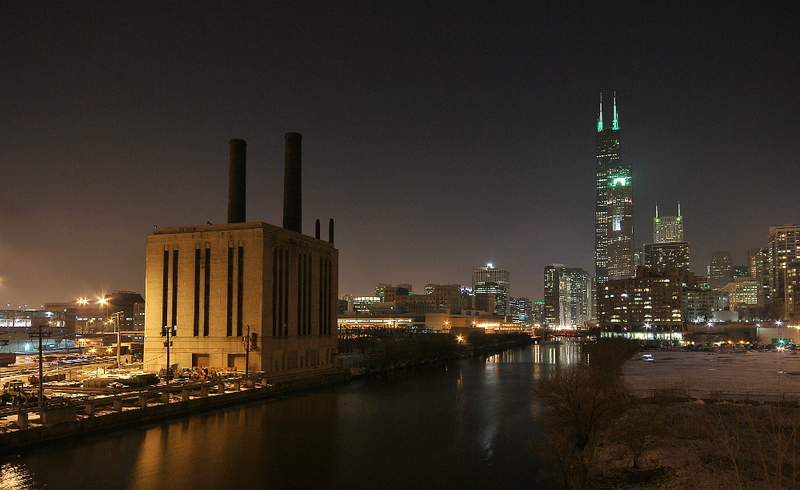 In the background, lit green for National Emesis Awareness month, is the Sears Tower. So long and thanks for all the free fish. So many implications, so little time to explore them all. I’m just going to go with creepers trying to lure dolphins in. Makes sense to me. 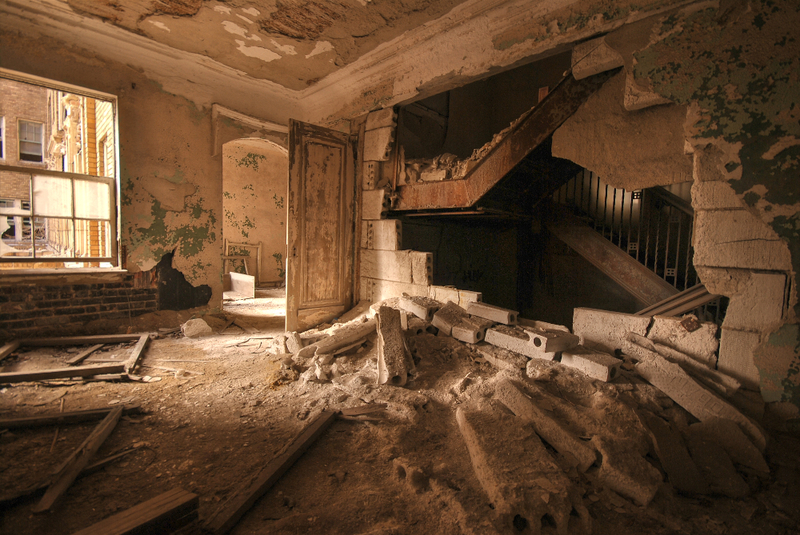 Are you looking for ruined hallway photography? Well, you’ve come to the right place! 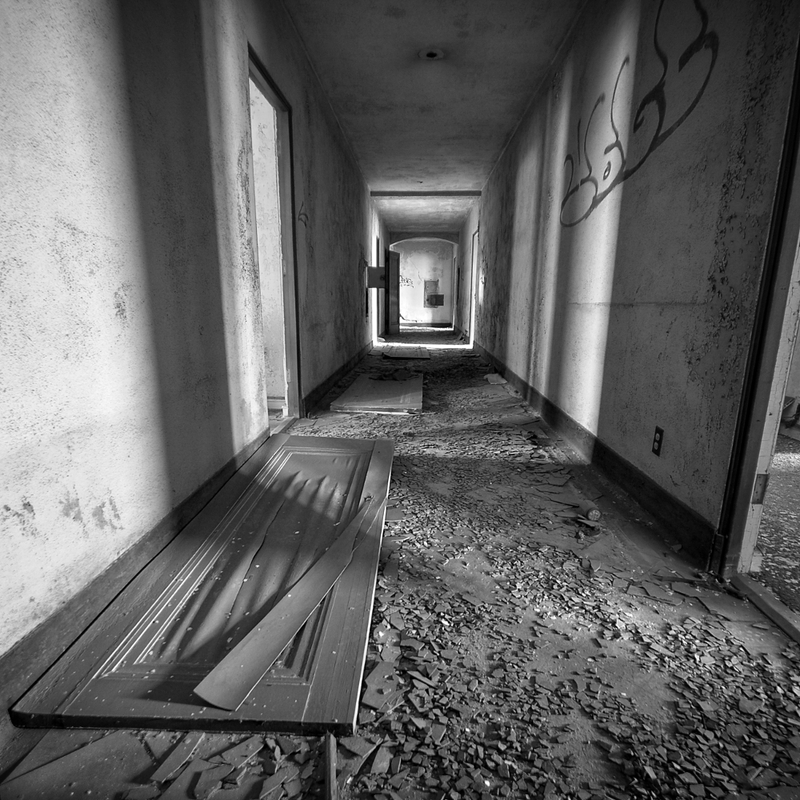 Here at the Idiot Photographer, we pride ourselves on providing you with the finest pictures of run-down corridors. Looking for a visual metaphor for transience? How about exercises in one- or two-point perspective? We got it! Black and white noir pieces, moody passageways? Yes! 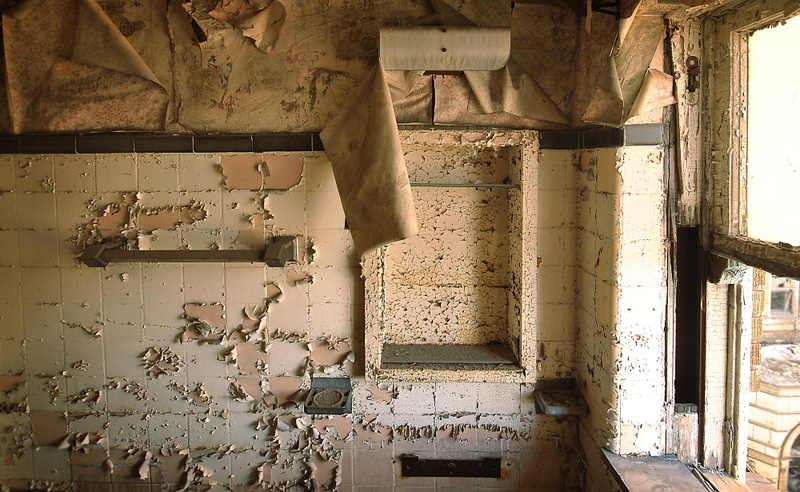 Remember the Idiot Photographer, your one-stop source for urbex hallway photography! As always, there are slight qualms about authenticity whenever we shoot in well-trod locations. This particular shot is from the Methodist church in Gary- the place to see in town if you’re just dipping your toes in the urbex waters. Consequently, the place is always changing: debris cleared here, new graffiti there, and leftover B-movie props laying about. The stage pictured here looks much different from the first time we saw it, when the original canvas backdrop was still hanging and the stage was littered with costumes. Ultimately, I try to adopt a Taoist approach to these things (though my partner the Idiot Photographer can’t help but disdain them), and just accept these sites and their inevitable changes as they are. After all, if someone thirty years hence likes this picture (should I be so lucky), they may appreciate it for its composition, and not worry too much whether the chair in the foreground was dragged there by an art school student with a vision. C’est la vie. I’m not a very bold person, we had avoided exploring the Ambassador Arms for years based on how decrepit it looked and figured it was too unsound to go poking around in. Once we stopped goofing around and got a little serious I looked the place up and found that yes, people do go inside. And yes, it isn’t a terribly sound building but if you’re willing to take a chance on the stairs (7 floors to the top) then it is a worthy explore. 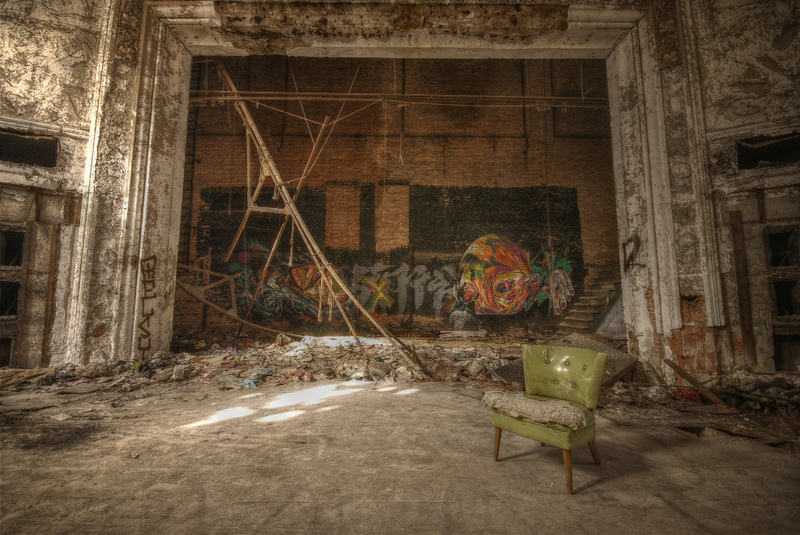 It isn’t the riskiest building in the world of urbex but it isn’t the safest building to go poking about inside of either. Or even to walk on the sidewalk next to. I’m not kidding about the stairs, my prediction is that within the next year or two the 6th floor will no longer be accessible as someone is going to go plummeting through the remaining stairs and wind up in a world of hurt as the risers have rusted out and now the landings flex under your feet when you go up them. It makes me happy that I made it up to the penthouse rooftop garden one last time to get this photo. I remember the first time I ever saw this bit of graffiti and had a really good laugh, because indeed I had never felt so brave before.